In a bowl combine flour and salt, cut in shortening until crumbly, add water 1 Tbsp. at a time and toss with fork until dough forms a ball. Let rest for 10 minutes. In a sauté pan over medium high heat, sauté red and green peppers, set aside and cool. In a large bowl combine corn and peas. Season with salt and pepper. Then add sautéed peppers, Isaly’s Chipped Chopped Ham, green onions. Stir to combine. In another bowl, whisk eggs with half and half. Roll Dough to fit a 9” pie pan, trim and flute edges. 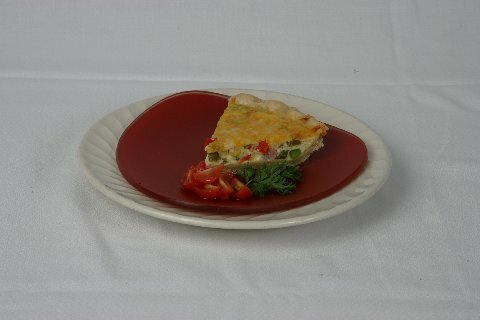 Place vegetables and ham mixture in pan, slowly add whisked eggs, and top with cheese. Bake in preheated oven until center is set, about 40 minutes. Allow to stand for a few minutes after removing from oven.